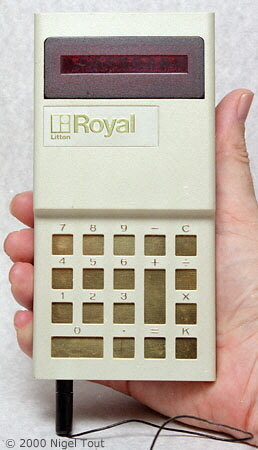 Distinctive features: Low-cost hand-held calculator, achieved by eliminating normal keys, having only a 4-digit display, and employing a "calculator-on-a-chip". Display is 4 digits, blue individual vacuum fluorescent tubes. Calculations are actually performed to 8 digits and the display can be swapped between the high 4 digits and the low 4 digits using the "<->" key. Is operated by touching the circuit board through the windows in the casing using the stylus. 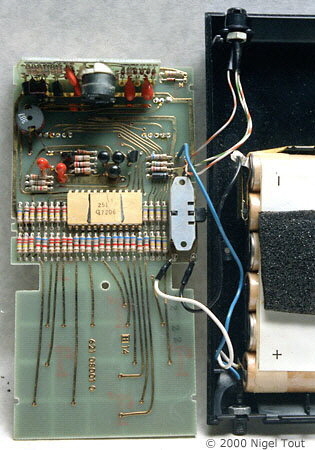 Main integrated circuit - General Instruments GI 250 "calculator-on-a-chip" (here date coded 7208). 7.2 v (6 x AA rechargeable cells). 81 mm x 165 mm x 39 mm (3.2" x 6.5" x 1.6"). 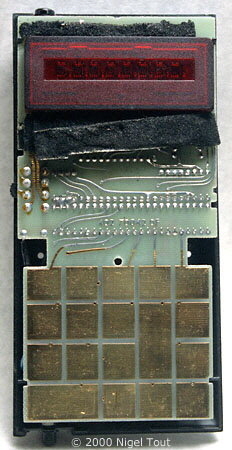 Made in U.S.A. by Royal Typewriter Company, Hartford, Conn.
With the cover removed to reveal the circuit board with the gold-plated stylus contact areas. 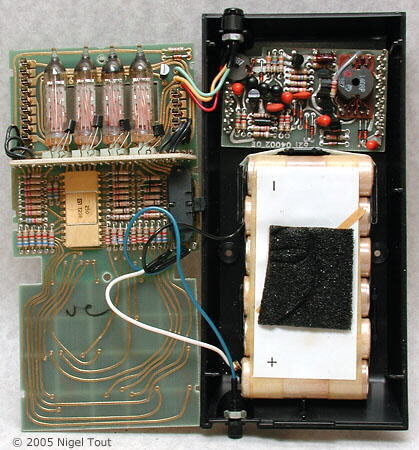 The main circuit board carries the calculator integrated circuit and the four display tubes. The base of the calculator holds a pack of six AA size rechargeable cells. 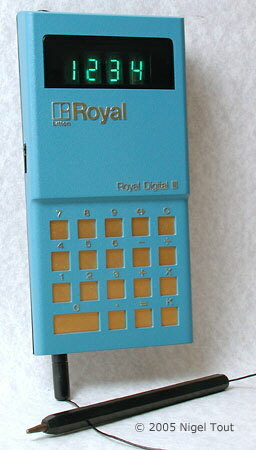 Distinctive features: Low-cost hand-held calculator, achieved by eliminating normal keys and employing a "calculator-on-a-chip". Main integrated circuit - General Instruments GI 251 "calculator-on-a-chip" (here date coded 7206). Made in U.S.A. This example "Made in USA for Imperial Typewriter Company Limited, Leicester, England". "Royal Consumer Products division, Hartford, Conn., a part of Litton Industries. With its Digital III and IV, made by the Monroe division of Litton, Royal is in a position to market these units to consumer outlets, from mass merchandisers to the corner stationery shop. With quantity discounts and prompt payment, dealers get these machines for under $90. Suggested retail prices are $139 and $149 [about £58 & £62 Sterling]." Price in UK, June 1972, £52-50. Royal, Imperial Typewriter, and Monroe were all part of the Litton Industries empire. 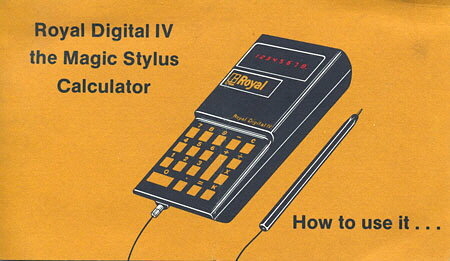 The cover of the instruction leaflet - "the Magic Stylus Calculator". With the cover removed to reveal the circuit board with the gold-plated stylus contact areas and the LED display. 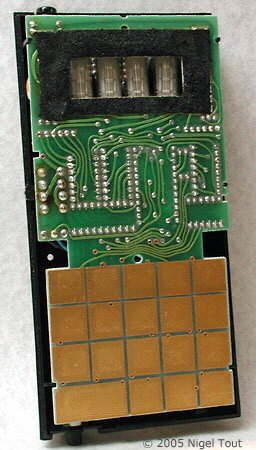 The main circuit board carries the calculator integrated circuit while the base of the calculator holds a pack of six AA size rechargeable cells. At this time calculator keyboards were complicated and expensive components. 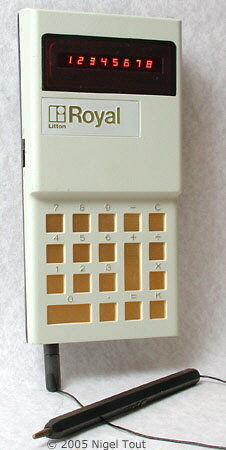 To cut this cost these calculators present gold-plated pads on the circuit board through the front of the calculator. Touching a pad with the electrically connected stylus has the same effect as pressing a key on a standard calculator. Only the Royal Digitial III and Digitial IV are known to have this stylus feature. They are also among the first calculators to employ "calculator-on-a-chip" integrated circuits.